BRYANT & MAY AND THE INVISIBLE CODE is the tenth book about Arthur Bryant, John May and their Peculiar Crimes Unit of the Metropolitan Police. BRYANT & MAY AND THE INVISIBLE CODE begins with two children playing a game called 'Witch-Hunter' - they place a curse on a young woman taking lunch in a church courtyard and wait for her to die. An hour later the woman is found dead inside St Bride's Church - a building that no-one else has entered. Bryant & May want to investigate the case but are refused the chance as it is outside their jurisdiction and are instead hired by their greatest enemy who wants to find out why his wife has suddenly started behaving strangely - he is convinced that someone is trying to drive her insane as she has begun covering the mirrors in her apartment believing herself to be the victim of witchcraft. The members of the Peculiar Crimes Unit dig behind the city's facades to expose a world of private clubs, hidden passages and covert loyalties; as they do so they realise that the case might not just end in disaster - it might also get everyone killed. Unlike the last book, BRYANT & MAY AND THE MEMORY OF BLOOD, I feel that this is not a good place for a new reader to start as it ties up an awful lot of loose ends in the series. However, if you do wish to start here then there is some background information that you could gather the bare bones of what has gone before from but not the full nuance. 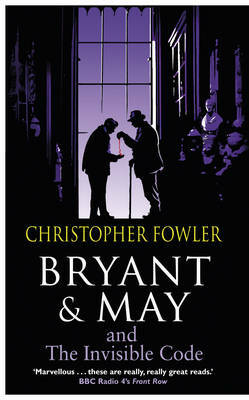 Overall this is another strong Bryant & May novel with a very intricate plot with lots of twists and turns. Some new characters are introduced to set up for the future some of which are almost half fantastical. Bryant, May and the Peculiar Crimes Unit will return in a graphic novel - THE CASEBOOK OF BRYANT & MAY - and may return in a novel if the publishing gods are willing - his blog says two more are outlined but not yet contracted.